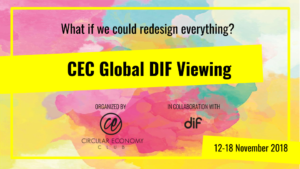 During November 2018, the Circular Economy Club (CEC) partnered with the Disruptive Innovation Festival (DIF) from the Ellen MacArthur Foundation to bring the knowledge to your city, anywhere you are in the world. The DIF is an online platform aims to shift mindsets and inspire action towards a circular economy. The festival invites people to share disruptive ideas and stories on a number of topics and attracts a worldwide audience, sparking critical conversations and participation through a combination of live interviews, films, and podcasts. The DIF is a crowdsourced event which provides empowering open access for contributors who want to showcase their new ideas, thinking, and initiatives with a global audience. A viewing party is essentially an event where you will gather different stakeholders of your community to discuss the content of carefully curated online sessions from the Disruptive Innovation Festival. All these videos have the goal to inspire you to ask the question: What if we could redesign everything? And look at this from the perspective of different stakeholders. The curation process (such as: selecting the topic, organizing the event, finding a venue), will be performed by you as the local Circular Economy Club organizer. You will be able to include the most relevant content from the DIF festival and broadcast it to your community. 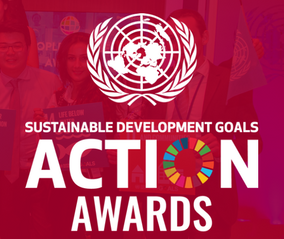 The available videos include live sessions from the Ellen MacArthur Foundation studio, from Universities, companies, thought-leaders, and authors. Some of the available videos can also be Google Hangouts, pre-recorded videos or podcasts. 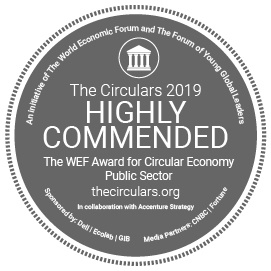 They cover many different themes, such as: exploring trends in systems thinking, reimagining learning systems assessing the role of people in the economy, exploring the future of food and other very timely and critical themes in the realms of the circular economy. Organize your own DIF viewing session by becoming a CEC Organizer.